Down four goals early and fighting for their playoff lives, a stubborn Colorado Mammoth team put on a gritty show of lacrosse to defeat the Calgary Roughnecks 11-9 on Saturday night at Scotiabank Saddledome. The win moves Colorado to 4-8 on the season and sets up an enormous home-and-home series with the Vancouver Warriors next week. After Robert Hope opened the scoring for the Mammoth, Calgary responded with a five-goal run. Trailing by four and desperate for a win, the tide of the game began to change. 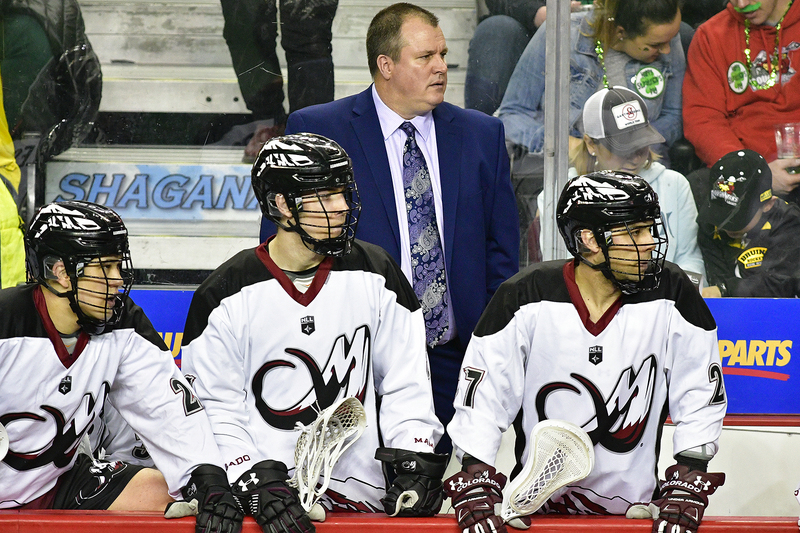 Earlier in the week, on Stephen Stamp’s Boxla Beat Podcast, head coach Pat Coyle spoke about the challenges of being both a coach and a general manager. Speaking to the coaching side of the job, Coyle talked about having a strong team instinct inside him and a belief in the guys; that to look outside felt like a betrayal to his team. He said his Mammoth squad was far from done this year. Led by goaltender Dillon Ward and permeating throughout the rest of the team, Colorado validated their coach’s faith and went to work. The defense started getting stops and began pushing the ball in transition, resulting in goals from Dan Coates and Jordan Gilles. The offensive unit started chiselling away at the lead and by halftime the score was even at five apiece. Colorado went right back to work in the third quarter and built up an 8-6 lead. Calgary fought back to draw even at eight, but young forwards Kyle Killen and Eli McLaughlin scored a pair of highlight reel goals late in the game to put the Mammoth ahead for good. Dillon Ward stood on his head and allowed only five goals in the last three quarters to backstop the victory. For the Mammoth, their offense is now in the hands of a group of very young and talented forwards. Killen (age 22) led the attack with three goals and two assists. McLaughlin (age 25) had two goals and three assists. Ryan Lee (age 24) had three goals and an assist and Jacob Ruest (age 26) had four assists. Despite the disappointing loss, veteran Calgary forward Dane Dobbie reached the 400-goal plateau at 10:54 of the first quarter. The lefty from Elora, Ontario finished the night with two goals and four assists to lead all Calgary scorers. 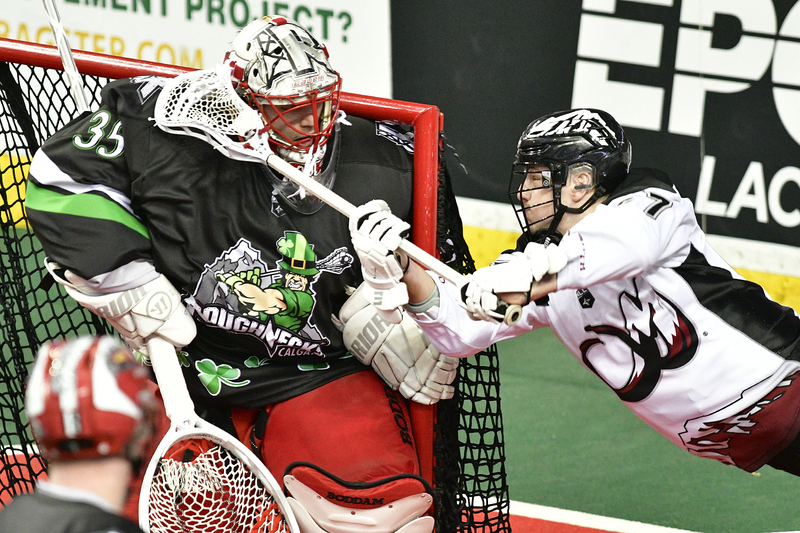 Dobbie is the Calgary Roughnecks all-time leader is goals (401), assists (428) and points (829). Next week, Colorado (4-8) will take on the Vancouver Warriors (4-8) in a weekend double-header. The first game goes Friday night in Vancouver, with the second game the next night in Colorado. Meanwhile, Calgary (6-7) will travel to Rochester Saturday for a date with the Knighthawks (2-10).